I have a nine-year-old daughter who, as is the practice in our diocese, went through confirmation and first communion (in tandem) about a year ago. Since then, I’ve been wondering if waiting until later for confirmation (as is the norm in most dioceses, I think) might not have been the better course. She was all for getting confirmed, seemed to really like the grown-up credentials that were thereby assigned to her, etc., which I thought was all well and good. But since then things have degraded. Getting this girl to mass every week has increasingly become an ordeal. She hates it, is bored by it, whines and moans and protests about it every week, and then sits through it as disengaged as she can be, occasionally asking when it will be over. This is troubling to say the least. With that in mind, tell me if the following deception on my part is morally questionable and/or in any other way ill-advised. Or is it a justifiable form of holy trickery akin to what Walker Percy said about the Catholic writer having to use every trick at her disposal to lure the reader into receiving the news from across the sea? She loved it. To tell the truth, I’m not sure to what degree she really buys it. I think she is willing to suspend disbelief and join in the fun of it to some extent. 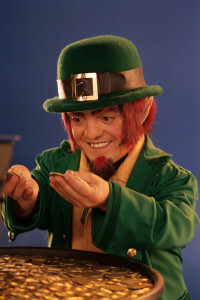 But at any rate, she is playing along and very keen on having a leprechaun she can exchange emails with. Ah, H_______ my dear dear girl, what do you think? Not only do you have your marvelous Sunday obligation today, when all the faithful (among whom I assume you are counted!) are obliged to partake of the presence of Our Lord in the bread and wine — not only that (as if that weren’t more than enough miracle to draw you forth to the church my dear girl) but today is the feast day of the great great saint, Patrick of Ireland, who certainly deserves to be honored in a special way with extra prayers and oblations and songs of praise … and of course the wearing of your finest green adornments, my dear girl. Now off to holy Mass you go and no more hemming and hawing! P.S. Here is a wonderful prayer of St. Patrick I hope you will share with your family on this splendid feast day. Will you invite your mother and father and sister to pray this prayer with you today? This would surely make St. Patrick smile down on you from heaven and the sun shine a bit brighter this day. Please advise, ye fellow bad Catholics. One of the best prayers ever written. Your leprechaun is a holy little guy. Sweet story. Thanks for sharing it. Well, it worked to the extent that she read St. Patrick’s prayer out loud to me with a look of astonishment and glee on her face the whole time. As for advice, hmm, you know her best. But with my kids I am pretty no nonsense about going to mass. Griping gets you NO WHERE. And if they are in the Church, they are building a practice and a knowledge that will be the resource when, some day, they will be at the end of their ropes and recognize they need God. I have to admit we go to a parish my kids generally like quite a bit,and our parish priest is very personable and knows them by name. But I remember being bored as a kid, at least sometimes, and look at me: now I’m a Catholic theologian. I can completely understand your concern, really. But just keep making her do it and give her connections–that is, why mass isn’t just one hour out of your week, but integrated with it. For example, we pray every night as a family and I won’t claim it is pretty, but it really seems to help us as a family remember that God is the center, and mass is where Christ told us to meet Him. I don’t know if any of that helps, but you have my sympathy. And the leprechaun move to holiness is brilliant. Thanks for this, IC. It helps a lot and is much appreciated. Also, Jonathan, just to encourage you, there are studies out there that the single greatest predictor of children maintaining the faith into adulthood is being raised with a practicing father. They watch more than you think. Wiley from a violent men taking the kingdom by force perspective, but it makes me look back on our friendship and reflect on similar ways you may have hornswaggled simpleton Webb. Many things coming to mind right now. Like the time I spiked your drink and then wrote scripture verses backwards on your forehead with a sharpie while you were passed out? Everyone keep an eye on Potter, he’s all right now. IC is pretty much on track with our approach. Read her St. Patrick’s Summer by Marigold Hunt. It’s about some kids preparing for First Holy Communion and a variety of saints appear to them to teach them about the faith, including Saint Patrick – history and theology all rolled together. H & T still talk about it. Thanks Mrs. W. Guess what? The leprechaun just used a bit o’ magic to get this book from Amazon and have it sent to the Kindle reader app on H’s iPod. Also: Happy birthday to ye! hmm, I want to see this too. Thanks…. Sounds familiar. My daughter came into the Church in the sixth grade and was confirmed. By eighth grade, she had a full-on hate going, no doubt due to someone (a teacher or her mom’s friends) pointing out how sexist and homophobic the Catholic Church is. She has since some to realize that the claims are overblown and that the Church has legitimate claims and rationale behind them. However, she’s still ambivalent. Keep insisting, and do what you can to get her engaged with the youth groups at your parish. One of my problems is that she lived half time at her mom’s house, and I couldn’t enforce the mass attendence or practice of the faith as consistently as I would have liked.